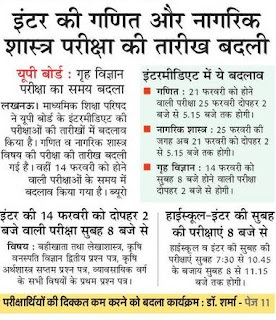 UP Board 12th Maths Nagrik Shastra Exam Date 2019 | UPMSP Exam Center List | MaTHS Nagrik Shastra Home Science | UP Board 12th New Time Changed | Latest News of Change in exam center and Evening Morning Timing. UP Board 12th Maths Nagrik Shastra Exam Date 2019 UP Madhyamik Shiksha Parishad recently changed the exam date of Maths, Nagrik Shastra and Home Science Papers. On 7th December Exam Regulatory Authority of UP Board published the new dates of UP Board Inter Maths Date Sheet along with Nagrik Shastra and Art Side Home Science Papers. all these changed of written exam shift associated with 14 February 2018. You may also check newspaper cutting in Hindi below to understand the real knowledge UP Board Subject Wise New Exam Date 2018-19. UP Board Intermediate Maths Exam New Dates: The UP Board Exam Subject which concluded on 21st February 2019 now transfers to 25 February 2019 afternoon 2 PM to 5.15 PM. 8.15 am to 11.15 am. UP Board 12th Nagrik Shastra New Dates: 25 February exam of Nagrik Shastra paper shifted to 21st February 2019 2 PM to 5.15 PM. UP Board Home Science Paper New Changed Date: The Morning Time paper of Home Science (8.00 AM) shifted to Evening time of 2.00 PM. UP Board Inter Exam Time of 14 February will be starting from morning 8.00 am. The Subject: Bahikhata, Lekhashastra, Krishi Vanaspati Exam Second papers, Krishi Arth Shastra 7th Question paper exam date, Vyayvsayik varg all 1st paper. Timing of High school and Intermediate board exam of UP: High school inters morning are papers starting from 7.30 to 10.45 am. New timing of morning paper is 8 am to 11.15.